I've seen a number of posts on covering bread for the first part of baking to trap the steam. Some people use roaster covers or other lids. My stone is 14 1/2 inches by 15 1/2 inches and I don't have any lids that will fit and still cover the loaves. Has anyone sculpted a lid out of tin foil or other material that would work? Or are you using larger stones? Or anyone have a better idea on how to accomplish this? A (disposable, but reuseable) foil roaster pan from any grocery store is probably your best, least expensive option. ps: I know "clocheing" is not a real word. I have a very large stainless steal mixing bowl that I use as a cover. The only other time I ever use the bowl is to mix pancake or waffle batter in when all the kids are at my house for breakfast. Thanks for this. An interesting idea. Now if I could just make it higher. Three inches doesn't seem as if it would be high enough. Improvise, look around your house, basement, shop around, take your time. I have a 16 x 16" stone, but I really don't bake a lot of "artisan" tpe breads. I bake mostly sandwich loaves and rolls, etc. The one time I did bake a batard, I was pleasantly suprised by the seemingly perfect performance of the steel basin/bowl on the right. ...the height and (top) diameter of the steel bowl you used to cover the boule? When you say the bowl is "steel", do you mean stainless steel or something else? and finally - is that bowl light weight (as in lower cost imports from India and/or China) or is it more heavy duty? I should probably just admit that I am probably in error in calling it steel, and should have known better. Almost all of my pots and pans, I inherited from my parents, and can recall seeing them around for well over 30-40 or so years. The round bowl is 5" high. I can find absolutely no identifying markings on it. However it is pretty light, and probably not rigid(or shiny) enough to be stainless steel. It actually seems very similar in composition to the "roaster pan(? )"(2 parts) pictured above on the left. Those are marked as aluminum, so that is probably a more likely assumption as to what the bowl is made of. ps: The inside diameters of the bowl are 11" at the top, and 14" at the bottom. "Top" being the side closest to the roof of the oven as shown. Also, the loaf was made using the Rose Levy Beranbaum NY Deli Rye recipe, an "adaptation" I found on the web. I think it was the literal recipe though. If you find a bowl large enough to cover your loaf but, for whatever reason, is not suitable for oven use, try using it as a form upon which to mold aluminum foil that you can the use as a cover for your baking bread. It's easy to reshape next time you need it and you can store in inside the bowl you used to mold it. Ooooh, what a good idea! I've been racking my brain trying to find something to use as a cover for my 14" long double baguette pan. I have this great roaster, except that the handles are riveted on and would "prop" the roaster up, letting all the steam escape. But maybe I can contrive something out of heavy duty foil using that as a "mold". I'll give your idea a try! ...that I have used is to bake the bread in the oven inside of a large roasting pan. 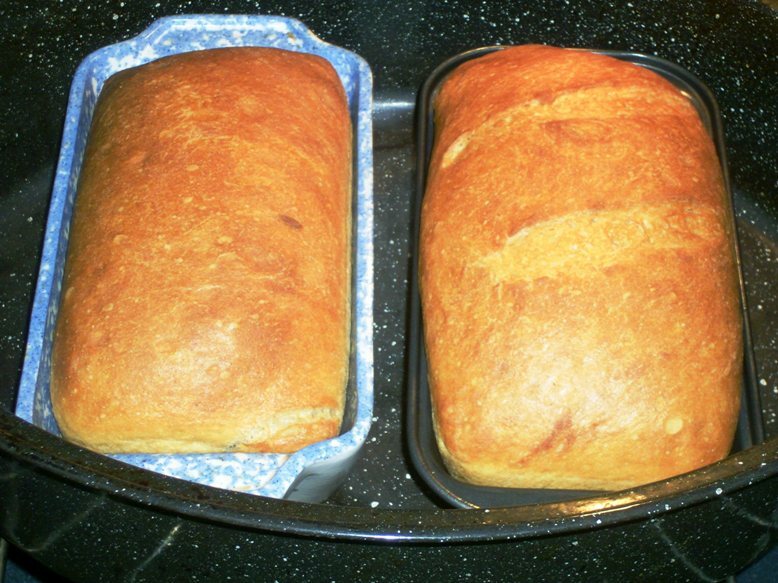 I typically bake sandwich loaves and my enameled steel roasting pan will accomodate 2 loaf pans, side-by-side. I preheat the roasting pan and lid and place the loaves inside, add a little extra water to the roaster and cover. It works well as the lid seals well and the crust turns out very well. I'd forgotten about modding terracotta plant pots like that, jackie9999. Have been intending to buy a stainless steel bowl to use as a cloche, but thanks for reminding me of the terracotta possibility. Do you heat it as you heat up your oven and stone, or just put it over the pre-heated stone cold after you've put the bread dough into the oven? What do you call the little metal stopper part that screws into the water release hole in the bottom of the pot? Would be good to have something to ask for at the hardware store, rather than attempt to describe it to a bored store assistant! Looks like that handle was made using an "eye bolt", two nuts and a couple of "fender washers". Ross, I do preheat mine in the oven..when I turn the oven on I set the pot off to the edge of the stone so that the heat gets all around, inside and outside. That's an eyebolt on the top, with a couple of flat washers and nuts. I wanted a nice size eyebolt that I could get a good grip on for lifting out of the oven when it's hot. It's surprising the difference in oven spring, and colour to the loaf, that it makes. 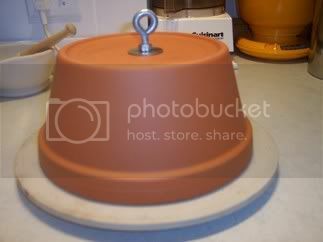 If I may ask, what is the height and diameter of your pot/cloche? From the looks, it will only fit on the lowest shelf in my oven(pictured above). 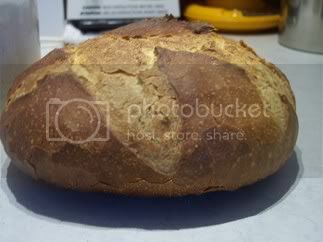 When the cloche is removed, do you move the loaf to a higher level to complete baking and browning? The diameter of my clay pot is 10" and 5" high. I usually bake a 500g boule and it's the perfect fit. I also have an oval banneton that I make a rye loaf in and I can just slip the pot over it - occasionally I will pinch the end of the loaf if I don't place it just so. My rule of thumb is to heat oven to 450 degrees, slide the loaf in and place the heated pot over it..after 15 minutes I lift the pot off and leave loaf to finish. If you didn't have clearance I would think you could slide oven shelf out, lift pot off and slide shelf back in? Thanks. It is not nearly as high as it appears to me. It would fit on the 2nd level up in my oven. Yes, it is nice. Do you preheat everything also when you use the cloche? I had orginally gone with the large eyebolt so that I could slide my wooden spoon handle thru the hole to lift the pot out. But I only did that once or twice..the first time the pot started to slide down the handle towards my fingers I decided to go the ovenmitt route and that's what I've done ever since. I don't quite follow your question mrfrost (if it was for me) I preheat the pot and the stone is always in my oven..I cook everything on it. I say preheat..but I just let the oven come to temperature and in goes the bread - I can't afford to preheat for any length of time like some members do. I am with you on the oven thing - I turn my oven on, once it reaches the temperature, my bread goes in. Maybe 5 minutes later. Particularly when using the covered method over tiles, I see no difference in the quality of my breads. Thanks for all the great responses, folks. One issue I have with terracotta pots: often lead is used in their manufacture. I've found it all but impossible to ascertain whether this is the case. Nursery folk never know (the pots are intended for plants, so fair enough), and it's hard to determine the manufacturer. I'm with you guys on putting the dough in the oven as soon as the temperature is right. 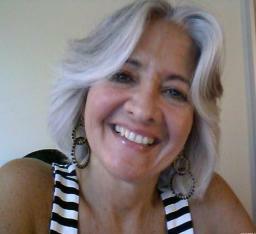 My reasons are economic and environmental. My breads turn out fine without pre-heating for an hour, or whatever. Good points! I have found that the lid to my Lodge Logic Double Dutch Oven is easy to remove, though -- and I have very little room in my smallish oven. Because the lid is fairly flat (shallow), and it has two handles, I can grab it with two pot holders on. I do have to pre-position a hot pad to receive it, though. It's also easy to open it a crack to let steam escape without removing it, and it's not as fragile as the pottery ones. It has been an excellent value. It's perfect for big boules, but not shaped right for long loaves, though. I had read about lead in terra cotta pots but any information I could find said the lead was in the glaze..my pot isn't glazed. It is stamped "made in Germany" plus the food never actually touches the pot, except for when a loaf is a little big and gets pinched. possible coverage option - a fish poacher. I went to the thrift shop the other day to see if I could find something that would do the trick for batards/baguettes. 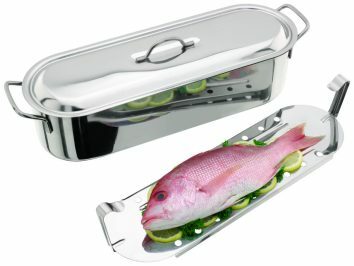 I was quite tempted to buy a cheap fish poacher. It has a perforated tray that sets inside and handles to easily lift it out of the poacher. I thought it would be easy to let the dough rise on the tray, move it into the oven and invert the poaching pan over it. The perforations in the tray would allow steam to come up into the pan. I ended up not buying it buying it would only handle one loaf at a time -- but I'm curious.. . Anybody on this board ever try using a fish poacher? I love it - it makes bread with perfect crust. The only problem is that baguettes need to be on the small side to fit inside the pan, but a regular loaf of bread fits perfectly. Anyway, thinking about my baparama pan, I see that it has quite a few similarities with a fish poacher - you need to use very little water, though. The water needs to evaporate within the first 5 minutes of baking the bread. I know other folks mentioned the baparama pan in this forum, I wonder if anyone posted a photo. I've found a solution to the problem I originally posted on this thread. I bought two thin 15" x 18" aluminum roaster pans, the kind that sell for a couple of dollars. They were two large to put either of them over my 14" x 15" stone, but they flare out at the top and the bottoms were only 15" long so I cut the bottom out of one of them and it then fit perfectly on the stone bottom side down. Then I cut the corner flaps off the 2nd pan so that, turned upside down, it would fit nicely onto the top of the first pan. This gave me a cover that was plenty high for any loaves. When the oven and stone were heated, I slid the loaves on parchment paper onto the stone, set the roasting pan without its bottom rightside up over the loaves and inverted the 2nd pan over the first. After 12 minutes I took the pans out to let the loaves brown. Result great oven spring and beautiful loaves. Simple and cheap. Thanks for sharing. A visual, both of your solution and loaves, would be much appreciated Richard. Any way you could post photos of your lids? Greatly appreciated..
To update my findings with the disposable pan, I've found one works just fine and it doesn't seem to make any difference if it doesn't fit your stone but overlaps. A simple cheap solution. What about the underneath of the bread? I've been using this method myself, to make bread rolls, for quite a while now, but when I started I found the underneath tended to overcook because the bread was in the oven longer. I use the cover for the first 20 minutes, then take it off for the last 15 to brown the tops. If I was to bake the rolls normally, probably 20 minutes would be long enough. Fortunately, the small, top oven I use has a top and bottom element, and I'm able to turn off the bottom element for the last part of the baking. 1. 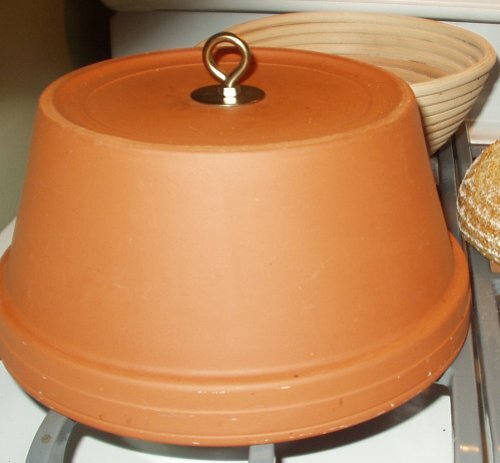 Clay pot--I preheat the lid, let the dough rise in the unheated base before baking. 2. On the stone covered with an enamel turkey roaster. 3. Stone with a Large aluminum baking sheet (because my stone isn't big enough) Baguettes in a Baguette Pan and covered with a pre-heated aluminum foil "buffet pan" (5 for $7 at Smart and Final). These passive steaming methods work great. If the dough is on the low hydration side, I'll sometimes mist it before putting in the oven, but rarely need to do that. The bottoms are always fine. The stone and/or clay pot do a good job of holding enough heat, and my breads bake quickly enough. I usually remove the cover when 50 to 60% of the estimated baking time is done. Perhaps you are leaving your cover on too long??? The next time I made my rolls I reduced the time to 15 minutes undercover; then I reduced it to 10 minutes, with about 12-15 minutes without the cover. Seems to be just about right! I heat the oven to 550. Then I use the disposable pan over the loaves for 12 minutes, (oven dropped to 450). Then I removed the disposable pan and change to convect bake for 15 minutes and they're done. Great crust and oven spring. It's just a foil roaster pan you can buy for a few dollars in any supermarket. Mine is actually too large for my stone lengthwise but that doesn't seem to be any problem. I usually spray the inside with water before putting it over the loaves in the oven. Before I had been trying to get one that was just the right size for my stone to keep the steam from getting out, but larger doesn't seem to make any difference.